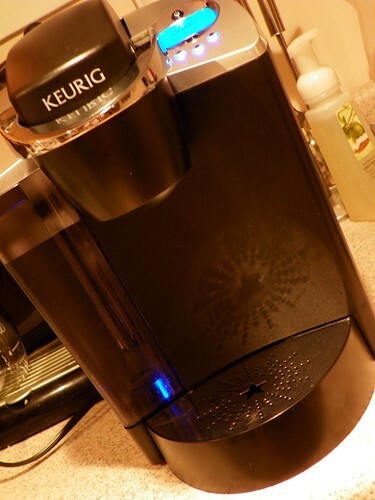 My love affair with my Keurig – Giveaway! It’s no secret that I’m addicted to coffee. And yeah, that whole giving up caffeine thing? That was shot to hell after about two weeks. 🙂 Luckily I haven’t been getting caffeine headaches recently, so I guess that short time period did something good for me! Anyway, a few weeks ago I was scrolling through my reader as usual and came up to My Baking Addiction (do you read Jamie’s blog? If not you should start immediately, because she has some AWESOME recipes). As usual my interest was piqued immediately, but this time it wasn’t because of a delectable, delicious recipe. Jamie had become a Keurig “K-cup Ambassador”, and had begun a relationship with Keurig, much like the one I have with Nintendo. Well beyond being jealous as all hell (because I love me some Keurig), I needed to find out IMMEDIATELY how I could become a K-cup Ambassador as well! So I reached out to the brand directly, and although they had finished selecting their ambassador program, they were nice enough to send me a Keurig of my very own to review! I already knew I would love it. Dave was hesitant, because in his mind we already had a coffee maker, so why did we need this thing? He clearly was not aware of the INSANE AMOUNTS OF AWESOMENESS that was to come when the Keurig B60 Single Cup Brewer showed up in the mail (with a whole bunch of K-cups to try)! We’ve had a Keurig at work for awhile, and it’s where my love affair began, but the brewer I was gifted with is far superior to the one our office has, and it’s super fast! It takes no time at all to heat, and begin pouring away in to your mug of choice. 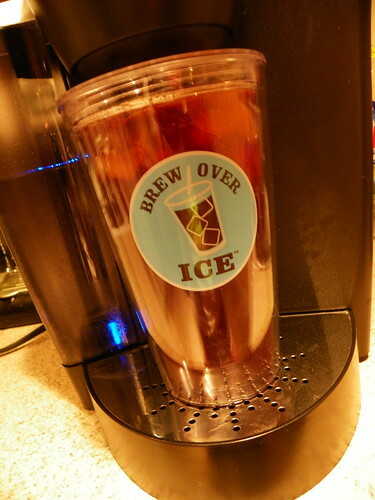 (I liked to use my special Brewed Over Ice tumbler I received awhile ago.) I also love that I don’t have to make an entire pot of coffee when I just want one cup. I never drink more than a cup when I’m at home, so for me, it’s a waste. (Not for Dave. Dave would stick a needle into his veins to intravenously inject the coffee if he could.) And the Brewed Over Ice part? Is the best! I’m not quite sure how the Brewed Over Ice K-cups are different from the regular cups, but it all tastes good, so I can’t complain! And here’s where the excitement comes in. Keurig is amazingly awesome (as you’ve already learned) and is letting me give away a Keurig B60 Single Cup Brewer to YOU. (I KNOW!) This bad boy is about a $150 value, and I can attest to it’s awesomeness. I’d say that I’d sing it’s praises, but trust me, no one wants to hear me sing. Contest ends on Monday, July 25 at 11:59pm EST and is only open to residents of the United States. Good luck!! Disclaimer – I was given a Keurig, and k-cup samples for free to review, and then conduct a giveaway on my blog. All opinions are my own. hands down my favorite is donut shop extra bold coffee. the chai tea latte is a close second. i think it seasonal, but there is a pumpkin spice out there and it is delicious. sometimes i make that and the chai and mix them together. i know it sounds kind of funky, but its honestly a million times better and healthier than the starbucks pumpkin spice latte. I have NEVER tried these before, but I’ve been ogling the machine for ages! I want to try to make iced green tea with the Twinings of London Green Tea cup. We used to have a Keurig at work and it was the saddest day when we suddenly stopped having it. I used to have a caramel vanilla in the afternoon if the day was really rough. Oh my, there are so many choices! I think my favorite would definitely be the Cafe Escapes Chai Latte — it would be wonderful to make them at home every day! I follow you on Twitter (I’m @princesscait). Umm I’ve been lusting after a Keurig of my own for AGES. I just haven’t been able to allocate any funds to replacing things I already have. (Meaning, I already have a coffee pot. It works fine, I guess. I should probably spend the $$ on school books and bills and gas. Epic sads.) It’s one of those purchases that I tell myself, when I have a real job, I’ll buy one. If I had a Keurig, the first flavor I would buy would be the Island Coconut Coffee. I’m currently obsessed with all things coconut! PS I follow you on the Twitter. I have the same problem with coffee. I have kidney stones so if I drink more than one cup a day, I’m in bad shape. So I waste SO MUCH because I live alone and even when my boyfriend is here, he doesn’t drink it. I LOOVE anything vanilla so the Caramel Vanilla Cream sound DEVINE. Butter Toffee What?! And I love that they make hot cocoa too! And I’m connected via Google Friend Connect. I’ve been dying for a Keurig! I have a pod coffee maker (not a Keurig) except it dying and I need to upgrade. It’s hard for me to have a favorite flavor, since I don’t have one I’ve never actually tried any. I’m always a fan of French Vanilla flavored coffee, but some of the others like Raspberry Chocolate Truffle sound amazing! This is such an awesome giveaway! My favorite is the french vanilla iced coffee! I’m not sure what my favorite would be… but I would love to try Chocolate Almond Coffee! I like you on the Facebook! I’m following you on GFC! I bought my mom a Keurig for Christmas, now I’m jealous that I don’t have one! My favorite is the Chai Green Tea! I follow you on Twitter, too. I love the hot cocoa K-cup. Pick me! and on google friend connect as well! Oh, my God, yes, PLEASE! My favorite K-Cips are chai. And then I mix them with black coffee. YUM. the hot cocoa would be great! My favorite is definitely the hazelnut. MMMMM! I can’t seem to find it on the site but I KNOW they have a pumpkin flavored coffee (I’ve had it). And Mama likes anything pumpkin! Fun story, I actually have a Brew Over Ice cup that I got through a contest on Facebook. I LOVE that cup! I totally already follow you on Twitter. And I didn’t realize you had a Facebook page, but now I know! I love love love my Keurig! Mine is the smaller version and I’ve been looking to upgrade. My favorite K-cup is the Green Mountain Island Coconut. It’s seasonal so I always stock up and order 6 boxes at a time! hazelnut pleaaaaaase! dang i want to win this!!!!! My favorite is the Colombian Fair Trade. Socially responsible and tastes great! I just saw that they have a hot apple cider! Now that sounds like a great thing to try! I like you on Facebook, but more importantly, I like you in real life! Lol! What an awesome giveaway! I’m a sucker for the Hazelnut! I’m a Google Connect follower of the blog. Keurig is the shizzle mcnizzle. My favorite is probably the breakfast blend, since I only drink coffee in the mornings anyways. I follow you on FriendConnect too! I love French Vanilla and Hazelnut! I am obsessed with Hazelnut anything…yummmmm. I love the hazelnut flavor. I’m very very curious about the donut collection though. I haven’t tried that yet! I like Perks of Being a JAP on Facebook. I LOVE the donut shop coffee! This is so generous and a great giveaway. There is a K-cup distributor in my hometown, and my best friend worked there last year during the holidays, so she always had the most fun flavors! also a google friend follower! I love anything by Donut Shop, especially the Extra bold. Hazelnut! green mountain coffee! I am at an unpaid internship for 10 hours a day, 5 days a week and I need one of these. oh, and also, I follow you on twitter & facebook. Drinking some coffee, not good keurig, at my internship right now! My hubby is the coffee drinker in the house and his favorite flavor is the Green Mountain Coffee, Dark Magic Extra Bold Coffee. As for me, I love that you can make tea with the Keurig and I always go for Mint Medley–yum! I have to say, I love the original Hot Cocoa! oh man the cider, mmmmm cider. but really, what a great giveaway! My favorite would be the Caramel Vanilla Cream, who doesn’t like caramel?!?! Following you via GFC as well. Liked you on FB too, Mama needs her coffee!! Oooh my favorite flavor is Jet Fuel. It’s STRONG coffee that gets me going. I love it with a little half and half and splenda. Love the Ghirardelli Double Chocolate Hot Cocoa! I just “liked” you on Facebook. Favorite “flavored coffee” is the Pumpkin Spice. Favorite tea is the BOI Sweet Raspberry. I like all the Green Mountain varieties. Love keurig! Emeril’s “Big Easy” is a favorite flavor in this house. LOVE Donut Shop by Coffee People! the donut shoppe. hands down. obsessed. My favorite flavor is the Gloria Jean Butter Toffee. Just the smell makes my mouth water! following POBAJ on google friend connect! anddddd liked your blog on facebook. great giveaway girl, love ya! Love anything from Green Mountain – but especially the Nantucket blend. YUM. I love the Carmel vanilla. I would love to try the Donut House Cinnamon roll k cup! I follow via Gfc. And i can’t believe I nearly missed this giveaway o_o I read the original post and forgot xD Thank God I was thinking about you, Thanks for the giveaway! I like you on facebook as Andres Caceres. I follow on Twitter as bronco6686. LOVE keurig! My fiance’s aunt was good enough to have it shipped to our house (it was a bridal shower gift) so we can actually start using it:) I’m so glad they have my tea flavor of Bigelow Cozy Chamomile yum!